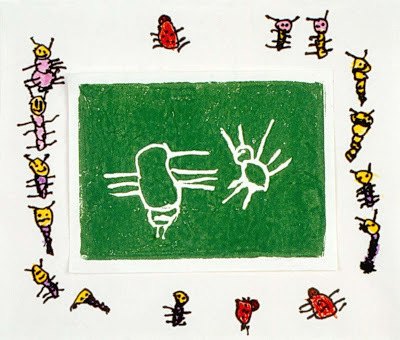 The children make simple relief prints and then embellish them with hand-drawn frames. For ages 3 to 6. Plan 3 sessions. Note: To make the frames, add 3½ inches to the dimensions of the printing plates. 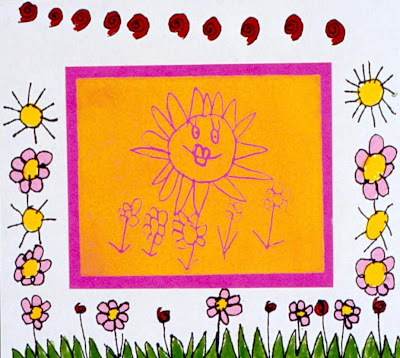 This calculation includes the ¼-inch borders left around the trimmed prints, resulting in 1½-inch-wide frames for the children to make their drawings. Set out printing plates and pencils. Prepare a demonstration area by covering the work surface with newspaper and setting out an ink tray, a brayer, printing ink, and construction paper. Explain to the children that they can make many copies of a single drawing by using the printing process. In this session they will be putting drawings on scratch-foam or printing plates to be printed in the next session. Show the children how to draw on the scratch-foam using a blunt-pointed pencil. Explain that the lines need to be pressed firmly, but not so hard that they break through the plate. Drawing on scratch-foam is made easier by pulling the lines towards oneself rather than pushing away. To demonstrate the printing process, place about an inch of printing ink onto the ink tray. With the brayer (a small roller used for transferring ink to a printing plate) roll the ink in several directions. Be sure the children understand that the intention is to have the ink evenly distributed on the brayer rather than the ink tray. Roll the inked brayer over the printing plate several times. Refill the brayer by rolling it across the ink tray again. Then roll the brayer over the printing plate in another direction. Repeat this several times until enough ink has been transferred from the ink tray and is evenly distributed on the printing plate. Explain that the areas pushed in by the pencil will not get ink on them. When the print is made, the pushed-in lines will be the color of the paper. The rest of the picture will be the color of the ink. This process is called relief printing. Show the children how to pull a print. Place the printing plate on a clean surface with the inked side up. Lay a piece of paper on top of the plate. Holding the paper in place with one hand, use the other hand to rub firmly with the soft part of the finger tips. Be sure to rub the entire surface. Tell the children that an important characteristic of a quality print is its sharp, crisp edges. They should rub around all the edges very carefully. When finished, carefully pull the paper from the printing plate. Explain that the children will be drawing suns on their printing plates. Discuss the roundness of the sun and the rays that form from the heat radiating from it. 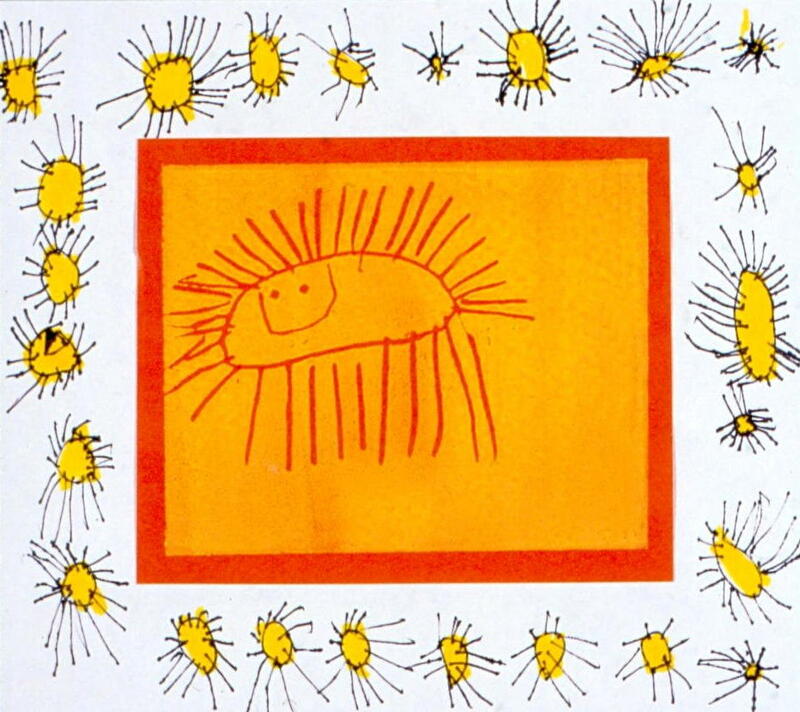 The children can add personalities to the suns with facial features. Have the children draw suns on the printing plates, reminding them to push firmly while being careful not to break through the foam. Prepare one or more printing stations. Each station should be covered with newspaper and include a magazine, an ink tray, a brayer, printing ink, and construction paper. Set aside a clean work area for rubbing and pulling the prints. In this session, the children will be using their printing plates to make at least two prints and more if time allows. Review the printing process, emphasizing the importance of evenly distributing the ink on the brayer and rubbing carefully around the whole print, including the edges. Place the printing plate on a magazine when applying the ink. As the children finish using the brayer to transfer ink to their printing plates, they should turn the magazine page so that the next person will have a clean work surface. Explain that you will be refilling the ink onto the ink trays because using too much ink will clog the lines on the printing plates. 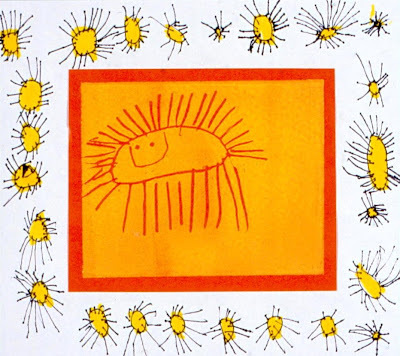 After the children make their prints, have each child choose his/her most successful one to frame in the next session. Note: After the prints dry, trim the ones chosen to be framed, leaving a quarter-inch border around the edges. Using a cardboard template, draw a 5- x 6½-inch box in the center of each 8- x 9½-inch drawing paper. This is where the finished print will be glued. Lightly mark an “x” inside the boxes to remind the children that the drawings are to be done around the edges of the boxes. Set out papers, trimmed prints, pencils, permanent markers, and watercolor markers. Explain to the children that they will be designing the frames for their prints. The boxes in the center of the papers are where the prints will be glued, so they should draw only on the outside border which will frame the print. 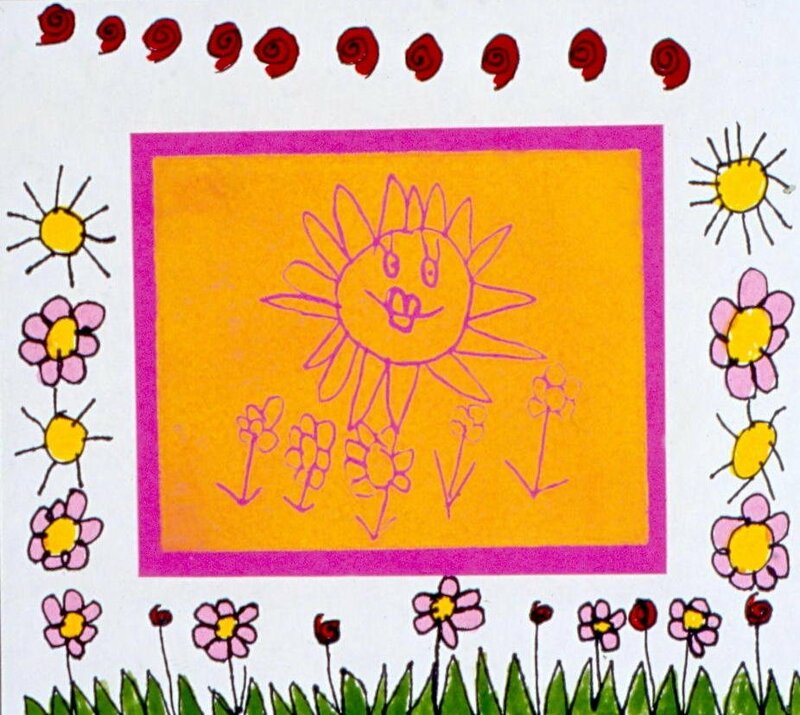 Using black permanent markers, have the children draw items which relate to the sun around the borders of the papers. When finished with the drawings, add color with watercolor markers. It’s best to keep the background color of the frames white so as not to overpower the prints. When the frames are completed, have the children use glue sticks to glue the prints inside the boxed-off sections. 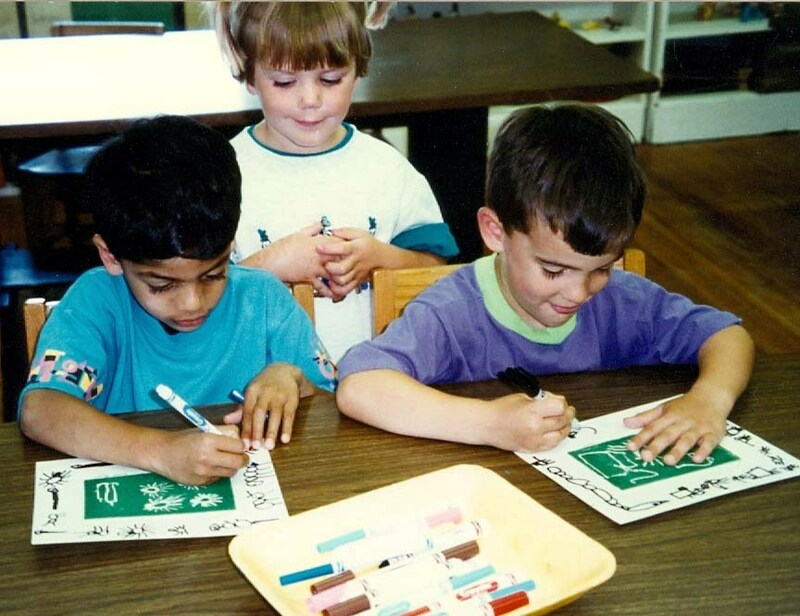 Drawing on the foam doesn’t take long, so if working with a small group, plan to print in the same session. Trimmed foam trays from grocery stores can be used for the printing plates instead of scratch-foam, but they are stiffer which makes it harder to draw circular lines. In order for the children to understand the printing process, it is important for them to see it done. However, when demonstrating be sure to use a subject different from the one the children will be using to avoid having them copy your image. A proper amount of ink on the ink tray will sound tacky when rolling the brayer across it. If the sound is smooth or slimy, there is too much ink. When working on the frames, the lighter colored watercolor markers allow the details drawn by the black markers to stand out better. 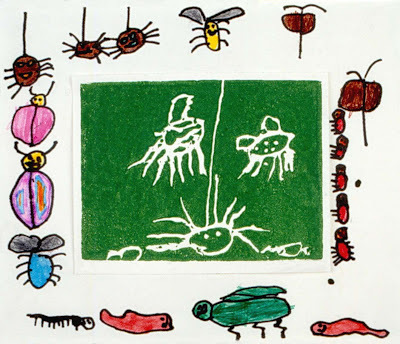 There are many themes that can be used for this project, such as "bugs" shown below where we discussed the three main parts of a bug's body (head, thorax, and abdomen); the fact that insects have six legs and two feelers while arthropods, or spiders, have four legs and no feelers; and that some bugs have characteristics like stingers, wings and mandibles. Is the ink distributed evenly on the prints? Discuss how the frames relate to the prints. Uh oh! I pushed too hard and made a hole. I'm going to draw flowers with my sun. I rubbed hard but I can hardly see the sun in my print. The paper slipped when I was rubbing and my print is smeared. I like all my prints. I can't decide which one to frame. One hole in your printing plate won’t hurt your print, however your lines will be easier to draw if you don’t push quite so hard. First draw a large sun on your foam, then you can add things that like sunshine. Sometimes your first print will be light because it needs more ink on the printing plate. When you add ink for your second print, it should come out darker. On your next print, be sure to use one hand to hold the paper in place while you rub with the other hand. Look at all your prints and choose one with even color and crisp, clear edges to frame.